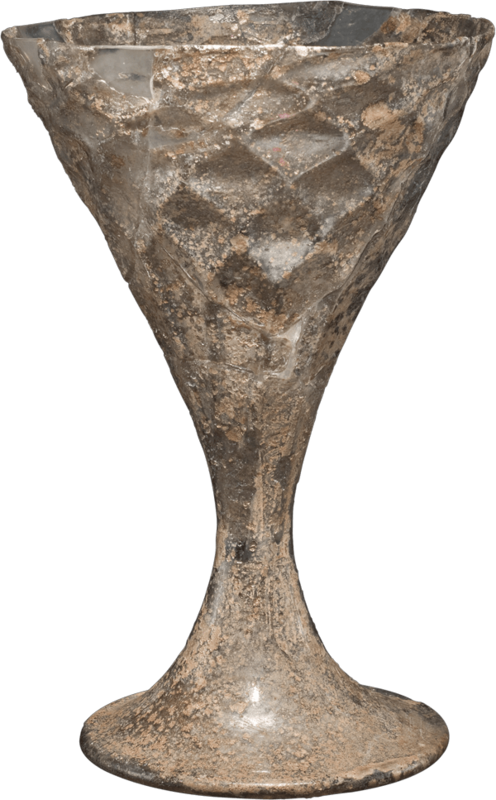 A pineapple dip mold is used to create the pattern on the body of this footed goblet. This vessel consists of two parts: a cup and a foot. 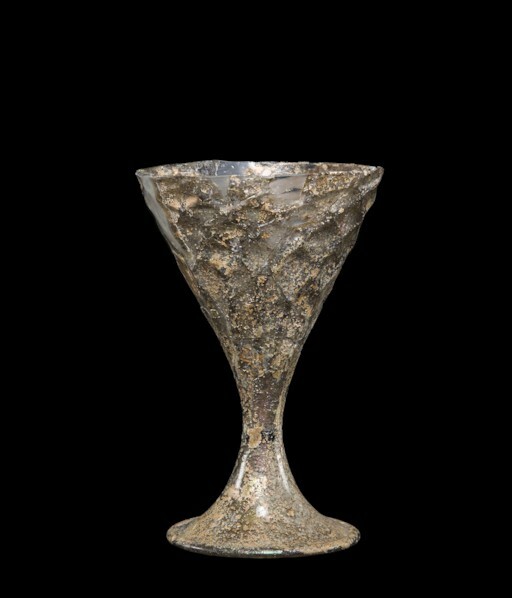 The cup begins with a gather of glass on the end of a metal blowpipe. The glass is rolled back and forth on the marver to make the glass perfectly concentric. The blowpipe is held upward so that the gather becomes spherical. When the bubble blows in, the walls are perfectly uniform. The bubble is tapered slightly. After reheating, the glass is lowered into the pineapple dip mold. The end is held with a tool and pulled while blowing takes place. Eventually, the vessel body has to be separated from the blowpipe, and this is done with a constriction or neck that is being formed. After the neck is completed, the lower half is reheated, spun with centripetal force to elongate the bubble, and excess glass at the bottom is trimmed free. The lower half is given its final shape; the tip is flattened somewhat. After the bowl is completed, the foot is begun. This, too, begins with a small gather of glass on the end of a blowpipe. The glass is marvered, a bubble blown in, and the bubble is carefully lowered, right on-center, onto the bottom of the bowl of the goblet. The bubble is cut free of its blowpipe. The foot is elongated with the spin of the blowpipe, and the area near the connection is given a constriction with the jacks. A constriction is made near the tip of the bubble, and this will allow a hole to be formed. The constriction is held with one tool, and the excess glass broken free. The hole is opened to the diameter of about an inch. The foot is reheated, and the soffietta (or puffer) is used to reshape the bubble. This vessel has a folded edge. The fold begins by pushing the edge inward and then beginning the opening process. Throughout, the entire vessel must be kept well above 1000 degrees Fahrenheit. The foot is tooled to its final shape. The punty site is cooled. The vessel is next transferred to the punty (or pontil). A tiny amount of glass on the tip of the metal rod is heated. The sides are rubbed in chalk so that they’ll stick only to the bottom of the vessel, and the vessel is broken free of the blowpipe. The edge or opening is reheated. The hole is enlarged to the diameter of about an inch. The shoulder or uppermost part of the vessel is reheated, and the soffietta (or puffer) used to shape the glass near its final form. Ultimately, the jacks are used to create the final shape of the object.